We got a late start with some errands and shopping to do, so we didn’t leave Tacoma until 12:30pm. We made a dash for Pullman, since we wanted to take a different route through Idaho, and we hadn’t seen WSU in a long time; and the boys had never seen it. We got to Pullman about 5:00 and drove around. Well, it didn’t take too long before we thought we had seen most of it! So off to Moscow and Lewiston. 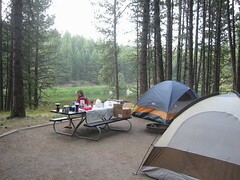 We found camping at Winchester Lake State Park on the Nez Perce Reservation. Idaho State Parks are not as cushy as WA. Pit toilets and no sinks in the restroom. Esther didn’t like that very well. We read at the picnic table until the bugs drove us into the tent. The ground must be very hard in Idaho or else I’m getting older!